Home Holiday	10 Dutch Dishes That You Have to Try! It’s Autumn, and there’s no better time of year to try some traditional Dutch kitchen staples. In case you aren’t familiar with stamppot or pannenkoeken, we’ve written a list of our top 10 Dutch recipes that you have to try this year on your holiday in Holland. If you’re inspired, you can even prepare many of these hearty meals in your own kitchen! 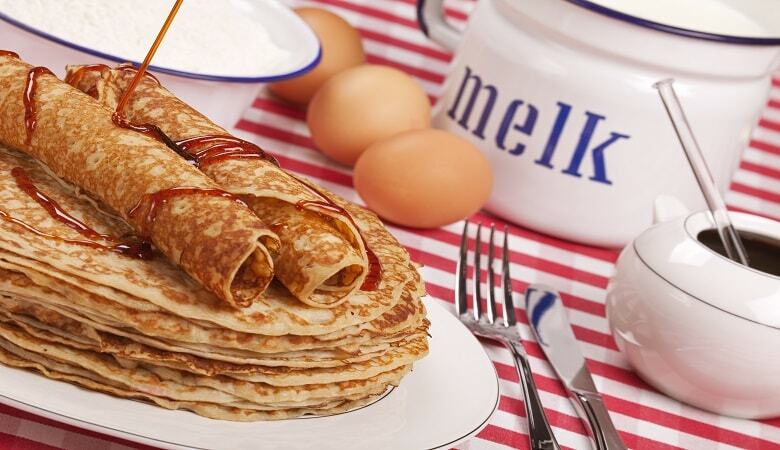 “Pannenkoeken” might look like a mouthful, but it is in fact just the Dutch answer to pancakes! They are large, thin, and served with a variety of toppings. When visiting the Netherlands, you will come across many pancake houses, both traditional and modern, that will certainly inspire next year’s pancake-day recipes. They incorporate sweet ingredients, such as apples, raisins and pineapples, but also serve savoury pancakes, featuring various meats and cheeses. The ultimate favourite is, brace yourselves, pancakes with bacon and syrup. We know, we thought it was madness as well, but it really is a delicious combination. Now, if you haven’t tasted a stroopwafel, then quite frankly you haven’t lived. 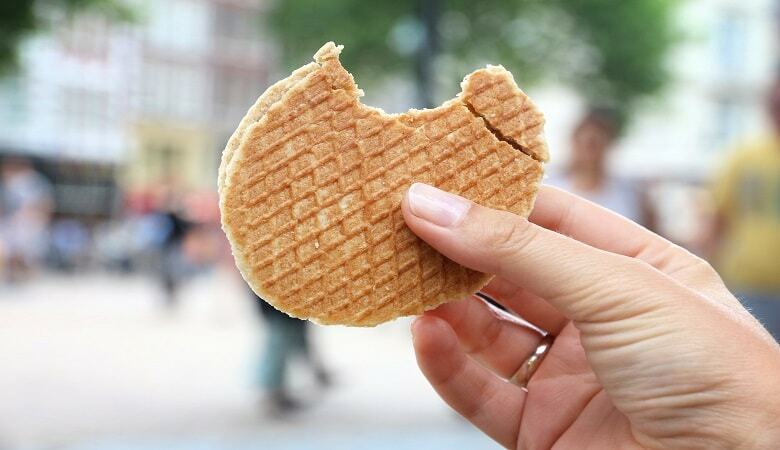 Stroopwafels are simply waffles with a caramel syrup filling. You don’t need to come all the way over to Holland to taste them, but you will not regret it if you do. At the Albert Cuypmarkt, for example, you can buy fresh, hot, homemade stroopwafels. It is a little piece of paradise in snack form and you will leave craving more. 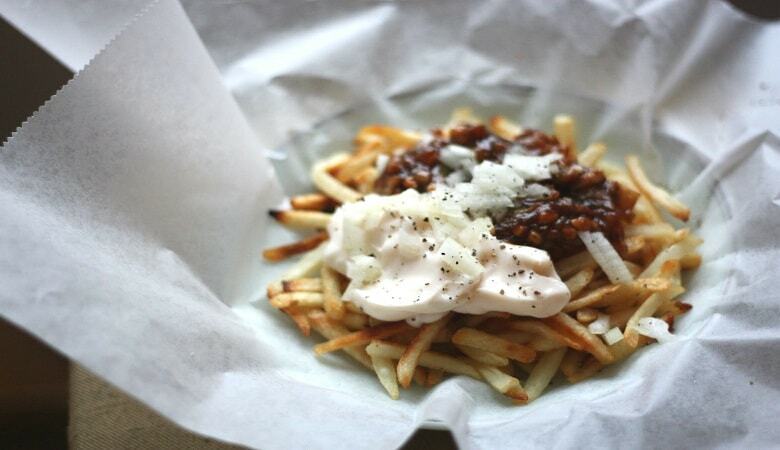 Another mad Dutch invention, Patatje Oorlog literally means Chip War. These delicious French fries are served with a combination of mayonnaise, satay sauce and onions. We’re not exactly sure why this particular dish has war in its name, so don’t quote us on this, but we can assume it’s to do with the battling flavours of the Netherlands and Indonesia, a former Dutch colony from where satay sauce originally hails. Enough fried food, pies and chips. What about some fresh fish? The Dutch coast stretches all the way from Zeeland in the southwest to the West Frisian Wadden islands in the north and forms a very important part of Dutch Culture. 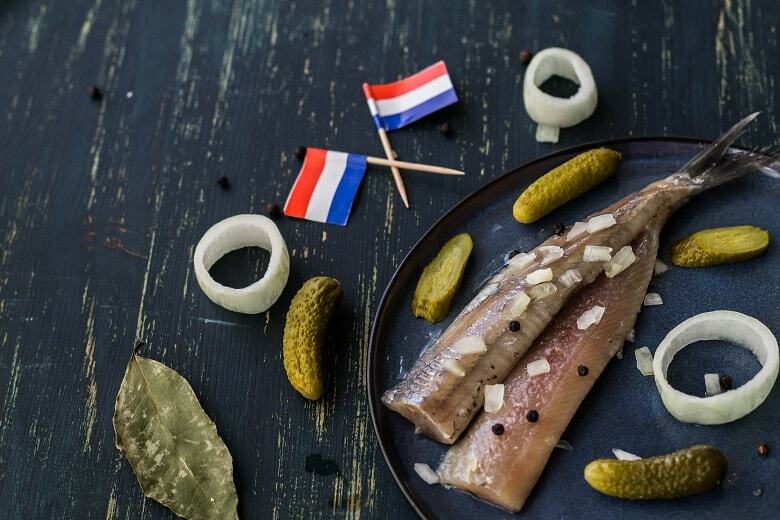 Hollandse Nieuwe is soused herring, traditionally topped with onions and eaten by holding the herring by its tail and tipping it vertically into your mouth. Delicious and healthy! 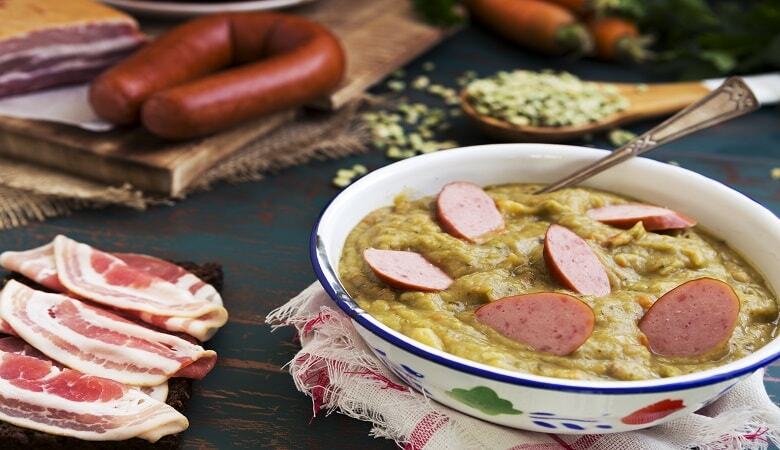 If you’re planning a holiday in Holland this autumn or winter, there’s no better way to warm up than with a warm bowl of pea soup, traditionally made with split peas, leeks, celeriac and smoked sausage. Wholesome and hearty, you can find this dish in many restaurants and cafes all over the Netherlands. 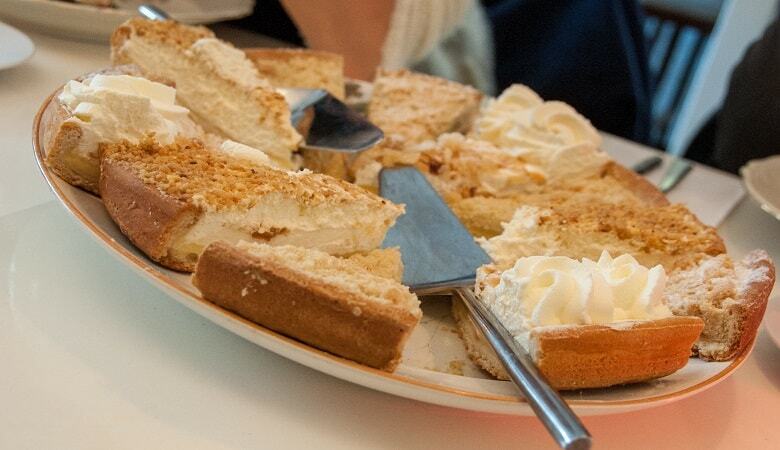 The Limburgse Vlaai is a pie or tart hailing from the southern province of Limburg. This fruity treat is characterised by a light, airy dough with a filling of fruit and custard. The fruit can range from cherry to apricot to plum, and this pie is often enjoyed at important events such as birthdays. Vlaai is definitely best enjoyed in Limburg in the sun with a cup of coffee. Bitterballen form a very important part of Dutch culture. At any event involving snacks and drinks, bitterballen are guaranteed, and for that, we are eternally grateful. So what exactly are bitterballen? Similar to a croquette, this bread-crumbed ball is filled with a thick, rich roux made from beef, butter, parsley and other herbs. 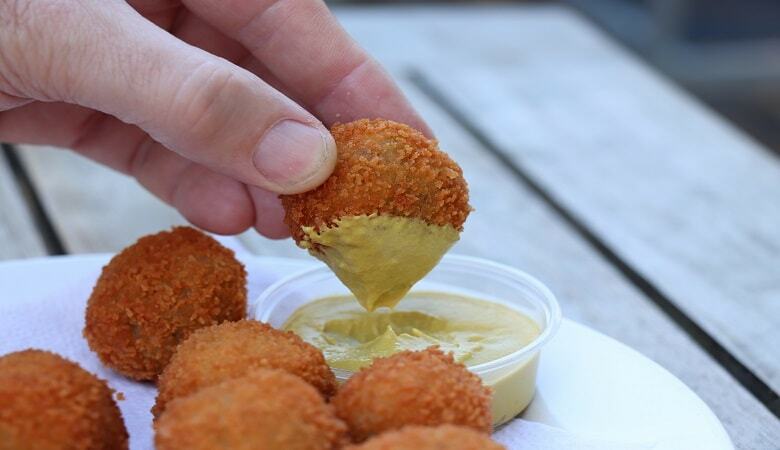 Served with mustard, these bite-sized snacks are ideal bar fodder. But be careful: the gooey centre of these party snacks are notorious for burning the palate. 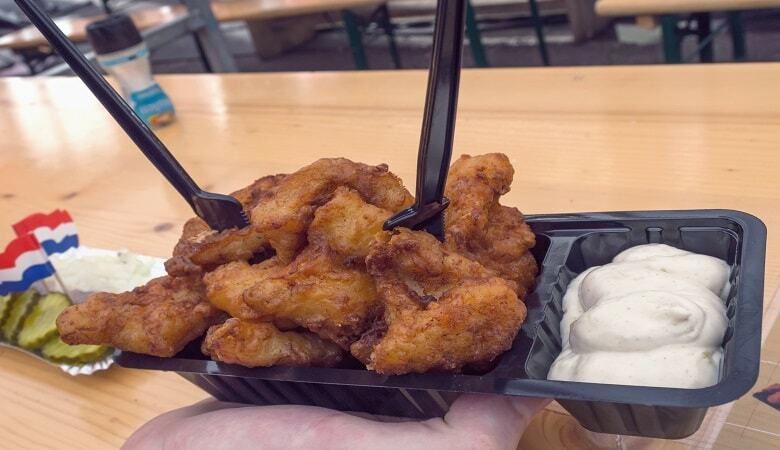 Kibbeling, the Dutchman’s answer to British fish and chips! There’s nothing wrong with a bit of home when you’re on holiday, and these tasty cod snacks are served up and down the coast in the Netherlands. The main difference to the British staple is that kibbeling is battered and served in bite-sized chunks. 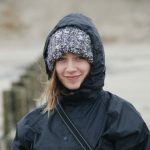 You can enjoy a long walk along the beach, kibbeling in hand. Drop is a liquorice sweet that comes in many flavours, shapes and sizes. Often black in colour, the salty varieties are about as polarising as marmite and can be found in almost every shop in the Netherlands. 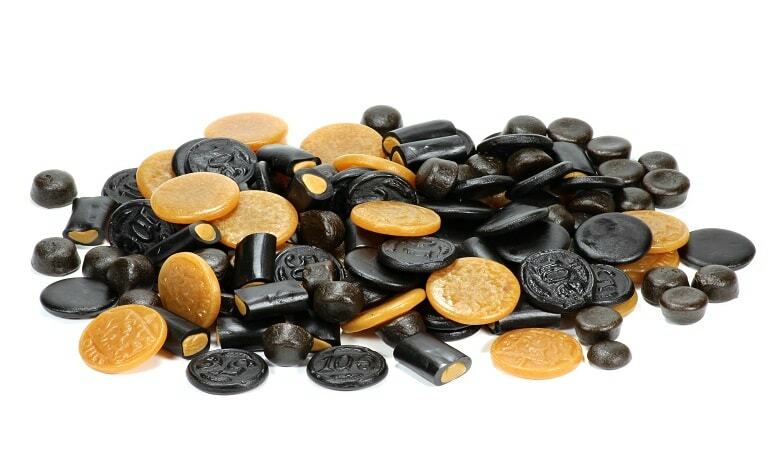 In fact, the Netherlands boasts the highest consumption of liquorice in the world per capita! If you’re visiting Amsterdam, it is highly recommended to check out the charming Oud-Hollandsch Snoepwinkeltje, an old-fashioned sweet shop reminiscent of the one Charlie runs into in Charlie and the Chocolate Factory. The friendly owner will let you and the kids sample the wide variety of drop; you’re sure to find one that suits your tastes. Another perfect winter warmer, stamppot is a traditional Dutch dish made with mashed potatoes and a variety of other vegetables, including carrots, onions, sauerkraut, endive and spinach. 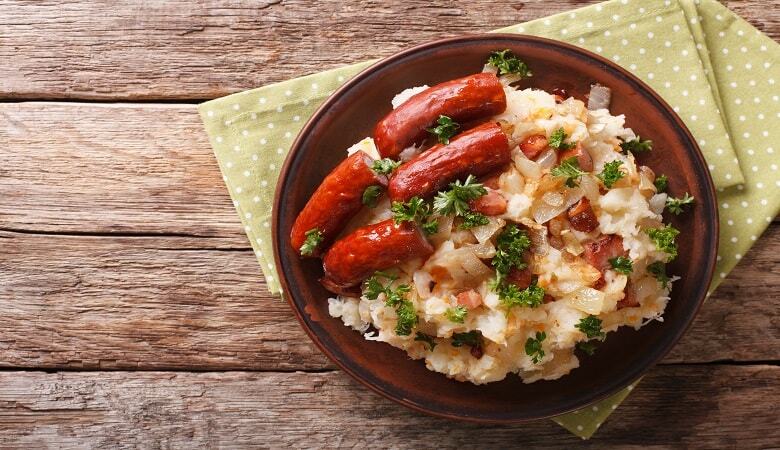 Usually served with a large smoked sausage, this is basically the Dutch take on bangers and mash. Moeders is a restaurant in Amsterdam that serves traditional home-cooked Dutch food in celebration of mothers. Take your mum there this year and you’ll be able to leave a photo of her on the walls! Now that we’ve got your mouths watering, it’s time for you to check out these Dutch classics yourselves and book a holiday park in Holland and buy some of this must try food in Amsterdam! Eet smakelijk!